1.) Prepare your recorded tracks. For the purpose of illustration, download these test audio wav files that will be used in this tutorial. 2.) Extract the zip file. 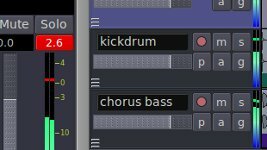 Inside the ardoursamples folder, you will find two wav files namely chorus bass.wav and kickdrum.wav. The format of this audio wav files is 24-bit/48KHz which is compatible with Ardour. 4.) 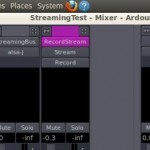 Under “New Session”, name it as ardourmixingtutorial to save the project and click “New”. 5.) Let’s import these two wav tracks to Ardour for mixing. Go to “Session” – “Import”. 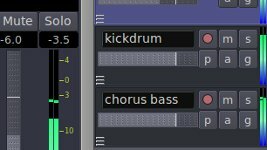 Under “Add Existing Audio”, locate the kickdrum.wav and then click OK. 6.) 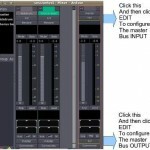 Also import chorus bass.wav to your mixing session in Ardour. 8.) Right click over kick drum audio wave, go to “kickdrum” – “multi-duplicate” – and set the number of duplications to 7. This will duplicate the kick drum clip 7 times. This can be very useful for beat/loop generation. 10.) Save the changes you have implemented in your Ardour session. Go to “Session” – “Save”. As you can see, the master audio clips at +2.6dB. In digital audio, the maximum peak allowed is only +0dB; beyond that its called clipping (as shown it’s red) and can cause distortion. So you need to decrease the volume in the master fader until it will hover around -6dB to -3dB (put more headroom to your mix). Based on the screenshot, the master fader was adjusted from 0 to -6dB, so that the peak on the master will hover around -6dB to -3dB (-3.5dB on the screenshot).